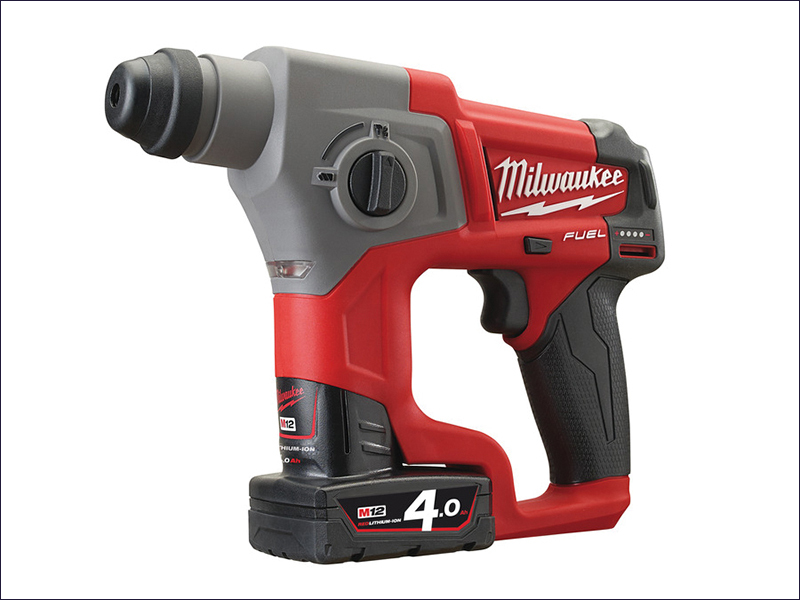 Milwaukee M12 CH-402C Fuel SDS Hammer offers superior power to weight ratio in its class with Milwaukee® designed and built brushless POWERSTATE™ motor for up to three times longer motor life and up to two times more power. REDLINK PLUS™ intelligence system delivers the most advanced digital overload protection for tool and battery and uniquely enhances the tool performance under load. Has 2 modes of operation, rotary hammer or rotation only for maximum versatility and optimised hammer drilling of 6 - 10 mm (Max 13mm). Has a low vibration value of 4.3 m/s², an on board fuel gauge and LED light. The 43 mm neck size is compatible with M12 DE dust extractor. Full load hammer action: 0 - 6200/min. Capacity: Wood:13mm, Steel:10mm, Concrete: 10mm. 2 x 4.0Ah REDLITHIUM-ION™ batteries.